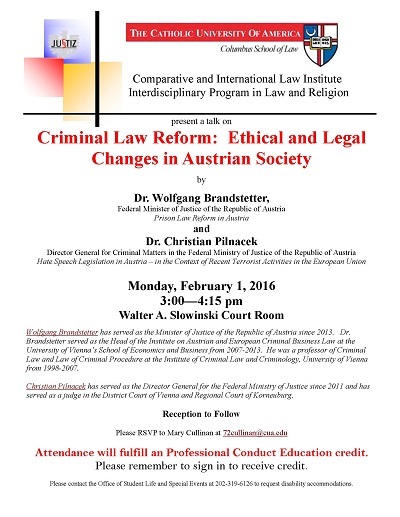 "Criminal Law Reform: Ethical and Legal Changes in Austrian Society" by Christian Pilnacek Dr. and Wolfgang Brandstetter Dr. The Interdisciplinary Program in Law and Religion and the Comparative and International Law Institute co-sponsored a lecture titled, “Criminal Law Reform: Ethical and Legal Changes in Austrian Society.” In light of the recent terrorist activities in the European Union, the Austrian government has focused on hate speech legislation and hate crimes. Dr. Christian Pilnacek, Director General for Criminal Matters in the Federal Ministry of Justice of the Republic of Austria discussed recent Austrian legislation that criminalized hate speech that has a likelilhood of inciting violence. Following Pilnacek's presentation, Dr. Wolfgang Brandstetter, Federal Minister of Justice of the Republic of Austria, discussed how the Austrian government is reforming the penal law system. Pilnacek, Christian Dr. and Brandstetter, Wolfgang Dr., "Criminal Law Reform: Ethical and Legal Changes in Austrian Society" (2016). Other Lectures & Events. 3.